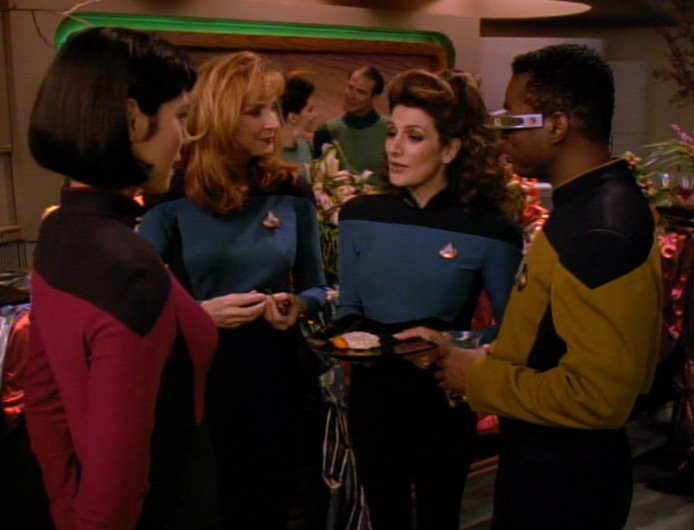 Last Monday, I went to Fathom Events' screening of two TNG episodes to celebrate the release of season 1 on Blu-ray. 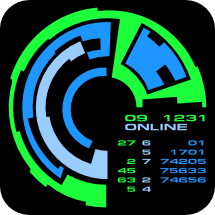 They showed Where No One Has Gone Before and Datalore. Matt has already discussed some of the nuts and bolts of the episodes is the comment sections, but I wanted to add mine. Where No One Has Gone Before was breathtaking. The crispness in the galaxy-scape and end of the universe scenes were incredible. And especially on the big screen, you could make out every hideous crinkle of whatever material that orange sweater was made out of. And the Crystalline Entity managed to be a new effect that was stunning but managed to remain completely in keeping with the original designers' intent. What struck me the most was not just how awesome the episodes looked themselves, but how great they looked on the big screen. But for the aspect ratio reminding you it was a TV show, both shows looked completely at home on the scale of a modern American cineplex. It's really a testament to the quality and detail put into the show even when the creators at time had to know it was just for themselves. It was also great sharing the experience with a pretty full theater. It wasn't quite Rocky Horror levels of audience participation, but everyone laughed and cheered together at the right places, particularly "Shut up, Wesley!" 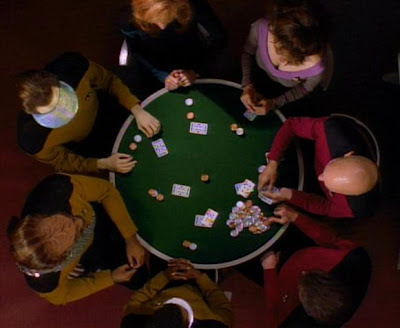 Matt and I will dive into the special features in a couple of days, but I wanted to talk about the preview for season 2's release, which apparently will reunite the crew in a roundtable to talk about the show. Michael Dorn is bald now, Jonathan Frakes has hipster glasses, and it's really fun seeing how they have all aged. In about six years, they will be the actual ages they were portraying in All Good Things, and I totally think they should reshoot the future scenes. Just for fun. By sheer random coincidence, I managed to have another Trek-related theater experience last week. I saw Stephen Sondheim's A Little Night Music at the Writer's Theater in Glencoe, Illinois. I was waiting to go into the theater and saw the cast list and noticed that part of Desiree Armfeldt was being played Shannon Cochran, whom Trekkies will recognize at Maquis member Kalita from TNG's "Preemptive Strike" and DS9's "Defiant" and, of course, Sirella, Martok's imperious wife from "You Are Cordially Invited." First, let me say, she was awesome. I love Sondheim, but this show is really easy to do badly, particularly for anyone inclined to overact or oversing, but the entire cast really was phenomenal, and Shannon Cochran in particular was amazing. I seriously recommend anyone in the area see it before it closes on August 12th. 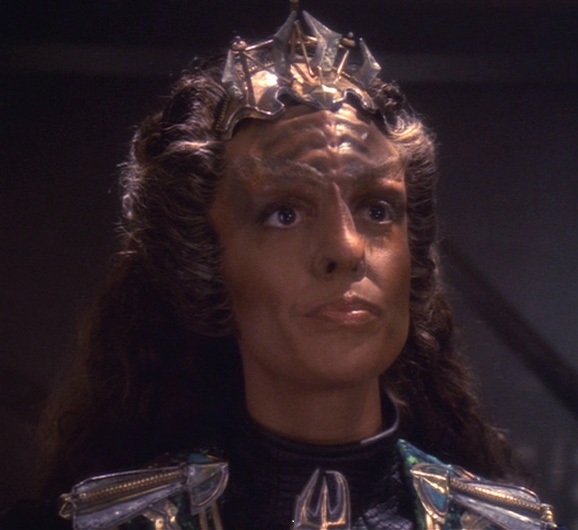 Also, if anyone asks what I did last Thursday night, I can say that I watched Sirella, mistress of the House of Martok sing "Send in the Clowns" and she almost made me cry. You haven't experienced Sondheim until you've heard him sung in the original Klingon. And a quick youtube search reveals that the theater has put a clip of the song online, so it's not even copyright infringing when I embed it. Now take a good look at the above picture and then hit play. It will make the transition more entertaining. So, just like our last top episodes post, when we finished TOS, we had a group methodology here. Kevin, Kelly, Beth, and I each came up with our own ranked top 20 list (not an easy task, either!). Then, points were assigned in reverse order - 20 for the top show, 19 for the second best, down to 1 for the bottom. The lists were tabulated together, episodes with better ratings won any tiebreakers, and voila, a group Top 20 is born. Relics received an 8 from the two of us. It's one of those shows that has flaws, but is just too cool to be denied (see also: Space Seed). The very fact that it includes a Dyson Sphere is probably reason enough for it to make a list. Some great Scotty scenes are icing on the cake. 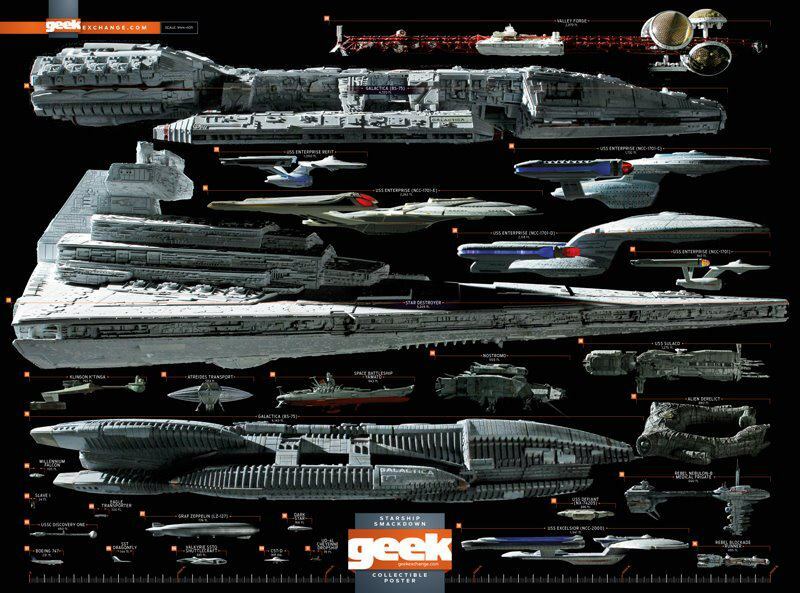 and points out that only one ship on it is older than the Enterprise, a flying saucer. 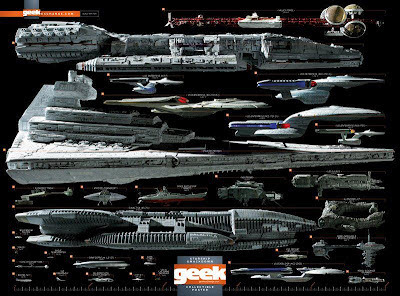 His argument is the ship should not just be judged against later ones, but you have to compare what that ship must have looked like at the time, and in terms of beauty and groundbreaking-ness, it's the Enterprise hands down. I personally favor the D, but that's more for aesthetic reasons. His argument is novel, and pretty hard to argue against. Also, who doesn't love Neil deGrasse Tyson and find it charming that he is speaking with such obvious enthusiasm? 2. I have my ticket to the TNG event in movie theaters on Monday for the release of the Blurays. So excited. I will have a full report Monday or Tuesday. 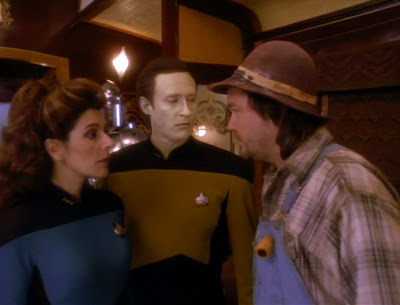 What is the best TNG episode? 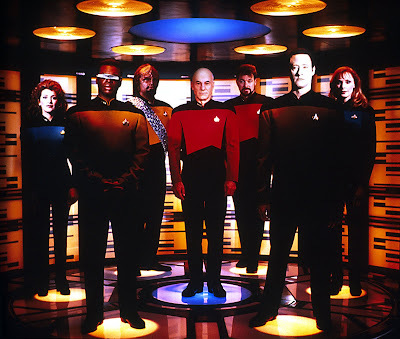 With six seasons already in the book, fans were greeted with some awful news: Season 7 would be the final one for TNG, since this show would be packing up its things to make movies, instead making room for DS9 and the soon to premiere Voyager to dominate the airwaves. Would Season 7 be a swan song or a triumphant conclusion? Maybe a little of both? Beam us onto the big screen! Ro Laren has returned to the Enterprise, fresh from a course in advanced tactics and a promotion to Lieutenant. But she is quickly put to the test, as Maquis renegades fighting against the Cardassian treaty stir up old resentments in her heart. An ordinary trip to holodeck and a Shakespeare play turns near-deadly when a train, the Orient Express to be precise, barrels through Prospero's island. As the crew investigates, even more strange occurences begin happening around the ship. Eventually, the ship even begins to exhibit a nascent personality. What is going on? 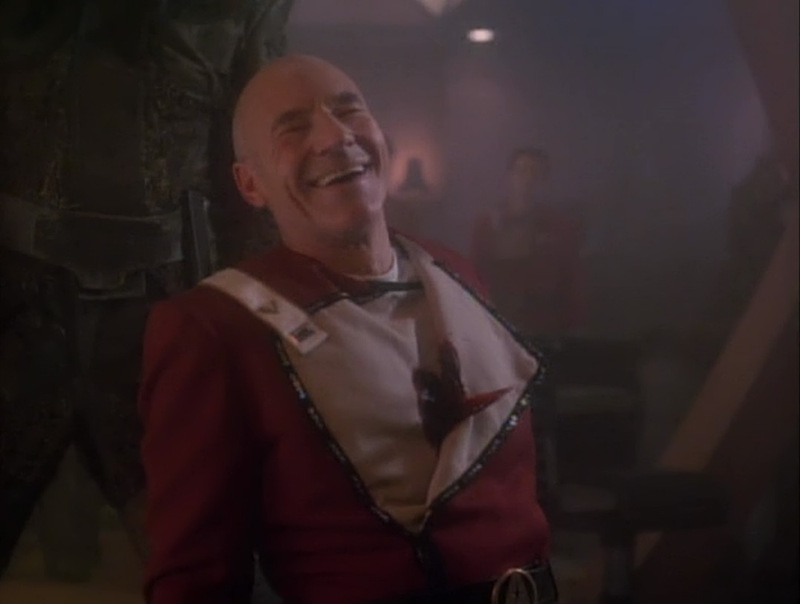 Why are people even allowed to use the holodeck anymore? 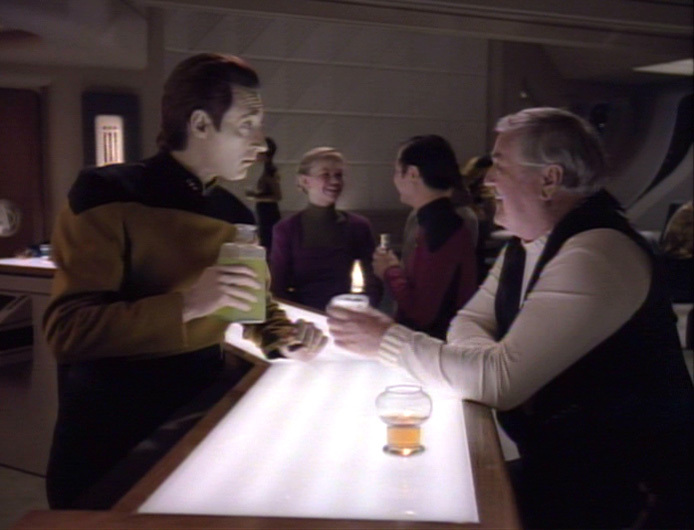 I sense dueling banjos, Data. Let's get out of here!